It’s natural to want to make a fresh start after divorce. Inevitably, at least one party must move out of the marital home. Where there are children involved, it is often the father who moves, to minimise disruption to the daily life of the children. Sometimes both parties move, often for financial reasons. Generally, when there are children, parents will remain in close vicinity to each other. But some choose to move away from painful memories and physically relocate much farther afield. This can cause challenges for access if the non-custodial parent moves, but he (usually ‘he’) does not face any legal issues in doing so. However, what happens when the primary caregiver parent (let’s use ‘she’ for the sake of convenience, as it is usually the mother) wants to move across or even out of the country? What is the legal position and what consent does she need to obtain? The primary piece of legislation for all matters concerning children is the Children’s Act 38 of 2008. The guiding principle underpinning all the provisions of the Children’s Act is: “in all matters concerning the care, protection and well-being of a child the standard that the child’s best interest is of paramount importance must be applied” (Section 9). However, the Children’s Act does not make specific reference to the relocation of one parent or the other, nor does it legislate consent procedures. Section 18 makes it clear that if one parent wants to emigrate outside of South Africa the consent of both parents is needed. For relocation within South Africa, the situation is less well defined. In the absence of legislative controls, decisions coming before the courts have been decided on a case-by-case basis, and case law is now brought to bear in new court hearings on the matter. An interesting feature of the Children’s Act is the provision (in section 18(4)) for parents with shared guardian responsibility to act independently without the other’s consent, including relocation within the country. However, the Act, with its overarching concern for the rights and interests of the child, also allows for the child, depending on age and maturity, to be informed and consulted on any decision (such as relocation) that significantly affects the child. It also allows for the other parent to be informed (Section 6(5)). Furthermore, the Act provides for the views of the other (non-custodial) parent to be taken into consideration in any decision that may impact on his rights, such as right of access. But the primary caregiver need not accommodate the other’s views, and even a failure to inform the non-custodial parent does not automatically invalidate the decision. It would, however, cause the decision to be reviewed. What does this mean in practice? Let’s say John and Mary are divorced and live in Durbanville and the child of their marriage, Sarah, who is eight, lives with Mary the majority of the time. Mary is considered the primary caregiver. John sees Sarah every other weekend and takes her to school on Wednesdays. Mary is offered a promotion which will significantly advance her career and render her able to provide Sarah with a better quality of life. The job is in Johannesburg. Because Mary is choosing to relocate for a ‘reasonable and bona fide’ reason (and not deliberately or spitefully seeking to remove Sarah from John’s range), it can be assumed that the move is in the interests of the child. Sarah, being eight, may or may not have the developmental maturity to be part of the decision, but is certainly old enough to be informed. Mary should consult with John, but he does not have authority to refuse permission for the move. Should Mary go ahead and relocate without telling John, he would be entitled to ask for the decision to be reviewed, but he is not automatically guaranteed a mandate to keep Mary in Durbanville. South African courts have tended to favour a ‘pro-relocation’ approach. 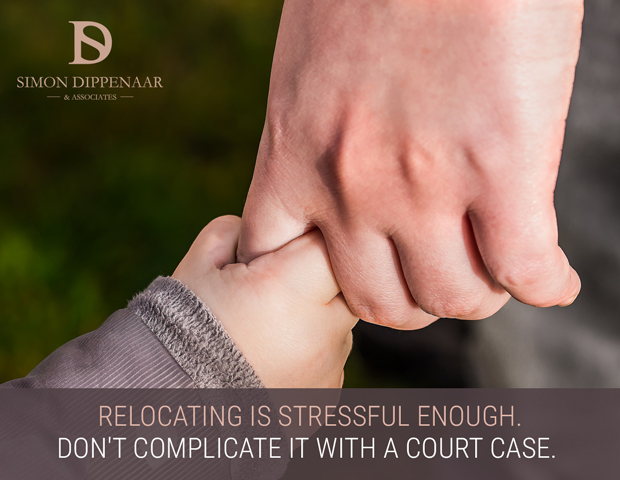 In Godbeer v Godbeer in 2000, the court upheld the view that if the decision to move is made maturely and rationally, it can be presumed that the relocation is in the best interests of the child. This principle was reinforced in Jackson v Jackson in 2002, where the relocation in question was international. The court decided: “…even if the access by the non-custodian parent would be materially affected, it would not be in the interest of the children that the custodian parent be thwarted in his or her endeavour to emigrate in pursuance of a decision reasonably and genuinely taken.” The opinion went on to state: “The reason why a Court is reluctant to interfere with the decisions of a custodian parent is not only because the custodian parent may, as a matter of fact, be in a better position than the non-custodian parent in some cases to evaluate what is in the best interests of a child but, more importantly, because the parent who bears the primary responsibility of bringing up the child should as far as possible be left to do just that.” However, it was unequivocally stated that the interests of the child must be the primary consideration. Other cases have taken a more neutral approach and given more equal weighting to the views of both parents. It is worth noting, however, that in one neutral approach case law example the children of the marriage were 11 and 14, and so their views (on a move to Dubai to marry a Dubai resident, out of a complex where both parents lived separately and the children could spend time with both on a regular basis) were much more seriously considered. Currently, as we have shown, relocation is not explicitly legislated in the Children’s Act. There are calls for a Relocation Act. Until then, we must continue to consider each case on its merits and rely on case law for guidance. Are you a primary caregiver who wants to relocate, or a non-custodial parent concerned about the relocation of your children? We can advise you on your situation. Contact Simon or call on 087 550 2740 or 076 116 0623 or email sdippenaar@sdlaw.co.za. Simon Dippenaar & Associates Inc. are experts in divorce and family law. You are assured of absolute confidentiality. This entry was posted in Child Relocation and tagged Child relocation, children's act, divorce, Moving with children, Relocation Act. Bookmark the permalink. ← Divorcing with dignity: is there such a thing as a peaceful divorce?